We’re delighted to announce that Swrve and Bluedot Innovation, a location-based marketing platform, have partnered to provide a best in class location solution for enterprises. Over the coming weeks and months we’ll be working alongside Bluedot to bring their location technology into the Swrve customer interaction platform, which in turn will enable brands to create campaigns based on a truly granular understanding of location data past and present. 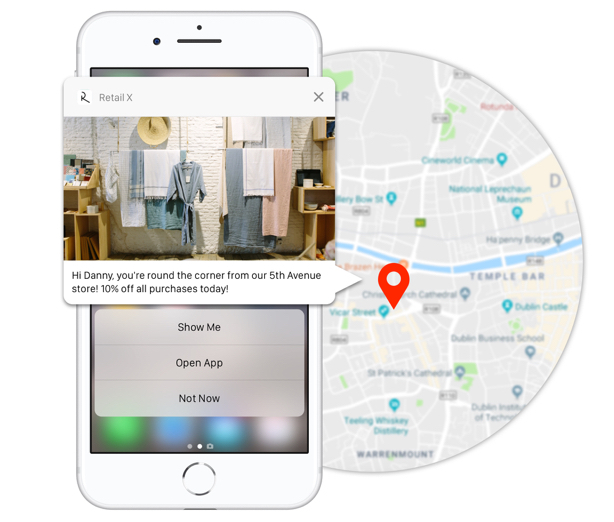 Put simply, location-based marketing enables communications over digital channels between brands and customers at specified physical locations. You will have heard of it before, and the ability to deliver location-based marketing is nothing new. But using Swrve and Bluedot the levels of control available to marketers will be more comprehensive and sophisticated than ever before: geolines can be set at any location, polygons of any shape can be formed, and essentially any location of any shape can be defined and then used to support a campaign. It’s an incredibly powerful way to interact with customers in the right place, at the relevant time, and with a contextual message. The result is significantly higher conversions and response rates compared to campaigns that are not location aware or only so in a limited fashion. Deliver relevant offers to customers who arrive at (or leave) a geofenced location. For example a push notification offering 10% off purchases in-store that day. Intercept customers at your competitors’ locations with ‘geo-conquesting’ campaigns to entice them to your store instead, be it a physical location or online. Build granular customer profiles by collecting behavioral and location relevant data about customers at any location or premise: even those you don’t own. Utilize contextual insights to re-target consumers on any channel - mobile, email, web, social. Turbo-charge your loyalty program by prompting customers at the exact time and place they can use their membership. Measure ROI of campaigns by comparing foot traffic across different locations. At the heart of all this is accuracy. All the location data in the world is no good to anyone if it isn’t giving a true ‘real world’ read of where the individual actually is. And that’s where this partnership really scores. Alongside Bluedot, Swrve is now delivering a solution 20 times more precise than other services, with accuracy delivered to within 5 meters. And this data is available at an unlimited scale to deliver 1:1 segmentation no matter how large your audience may be or where they are located. To find out more about Swrve and Bluedot, feel free to drop us a line!